Maricopa County is fastest growing per U.S. Census data... and here's why! 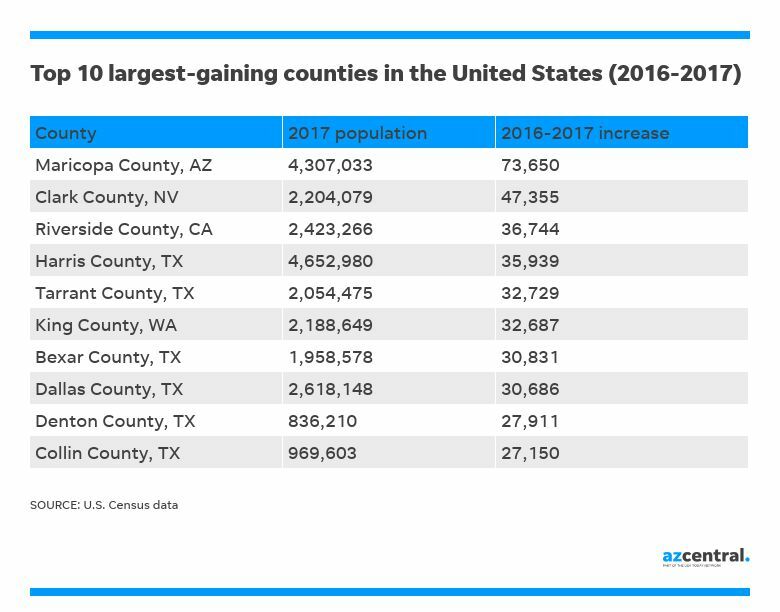 More people moved to Maricopa County than any other county in the country last year, according to U.S. Census Bureau population estimates released Thursday, March 15, 2018. And all of the Top-10 largest-gaining counties were in the South or the West. Maricopa County's population jumped by nearly 74,000 people — a 1.7 percent increase. The county's growth helped it maintain its rank as the fourth most populous county in the country, with 4,307,033 residents. Arizona also tied for the fifth-fastest growing state, gaining population at a rate of 1.6 percent in one year. The total resident count grew to 7.02 million residents in 2017 from 6.91 million in 2016, according to the U.S. Census Bureau, which tracked changes from July 1 to July 1 both years. The new data only includes population estimates as of July 1, 2017, for counties and metropolitan areas, not individual cities. See the cities I serve boasting safe communities, high paying jobs, excellent education and very affordable housing! Arizona ranked 14th in total population both this year and last. 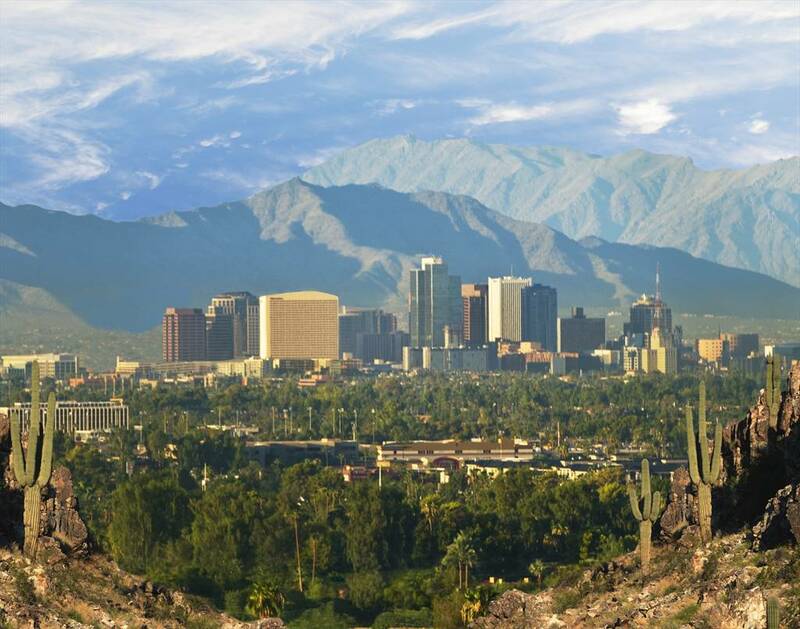 While the Phoenix-Mesa-Scottsdale metropolitan area is only the 11th largest metro area, with 4,737,270 people. The Phoenix-Mesa-Scottsdale area added nearly 89,000 people last year, the fourth-largest gain of any metro area. "Post-recession, we have worked very hard to build a more sustainable economy — one rooted in education and focused on exports, and it's working," Phoenix Mayor Greg Stanton said. He said, "We don't want to celebrate growth for growth sake," but in Phoenix and the region there has been a focus on quality employment that will sustain long-term growth. Stanton also noted that people are moving to the county's center city at a disproportional rate because Phoenix has made investments in transportation and infrastructure that boost quality of life. Call Sam today to learn more about the dynamic Phoenix Metro Area and let’s identify an area that will best meet your needs for quality of life, education, job opportunities, and plenty of clean, safe, affordable, single-family neighborhoods!!! Sam has 28+ years of residential real estate experience. Learn more about these AZ cities in his service area: Chandler, Gilbert, Mesa, Phoenix, Scottsdale, Tempe, Arizona retirement communities and investment property. Sam brings his vast real estate experience to help you decide which home is your best choice based upon your criteria for the perfect home.